Children in the water are such happy, ridiculous little things. Splashing and spitting and sputtering all slippery and floppy. 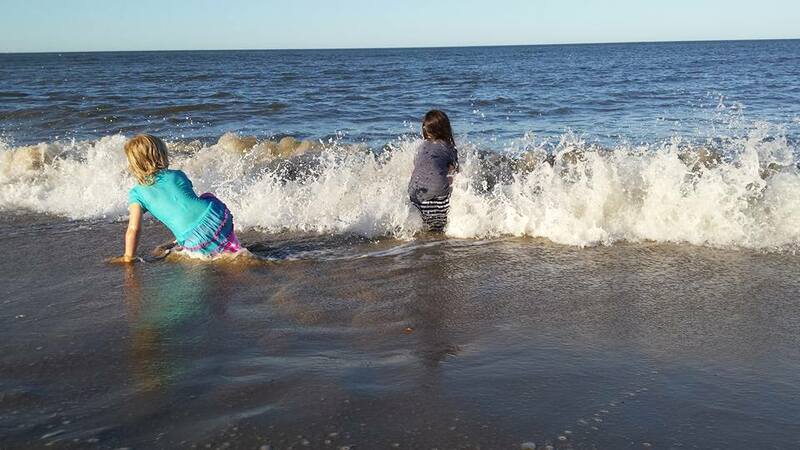 Their teeth chatter as they insist they aren't cold, because they suspect that if they get out there's a chance they might not be allowed to get back in again. And that would be the absolute worst. So the only solution is to stay in forever. Practicing flips and suffering the stinging, wavy vision of water-logged goggles that pull at their hair and make that bone behind their ears ache. There are so few things I would tolerate as an adult that children tolerate for the love of swimming. They'll put up with all manners of discomfort in order to remain buoyant and wet. It's kind of like parenthood, in a way. Accepting all the minor annoyances – the ears filled with water, the snot trails, the goosebumps, the hair that's impossible to comb – dealing with all these things for the opportunity to experience childhood all over again. It's always surprising. Always evolving. The joys here and gone like the tiny, blinking fireflies you chase after you've dried off. I used to be the person who jumped in first. Not worrying about the cold or how terrible the bathing suit looks or that I'm the sole mom in the water because at some point it was decided that only dads got in the pool. How did that become the normal? I want to be brave enough to be the mom flipping and splashing and flopping around in the water. 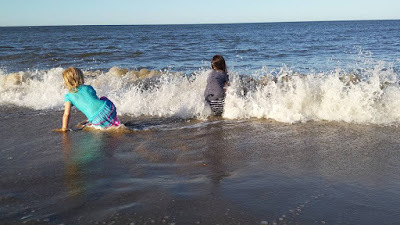 The last day at the beach when the waves were so big, Lily begged me to dive into one. "Do a flip in a wave, Mom!" Her eyes were so big and glittering – like if I did that one thing I would be her hero. The mermaid mom. I did it for her that one time. And because the waves were coming so fast again and again -- I got worried I might not be able to get back to the beach just yards away -- so the adventure became more about the return than the moment. I just started reading Elizabeth Gilbert's "Big Magic: Creating Living Beyond Fear." I've been avoiding creative living for this precise reason. Fear. And I have to say it's been really nice not having the pressure of "that novel I'm working on" crashing down on me wave after wave. Of course, it's also rather empty and kind of disappointing, too. I'm letting myself down. But not letting myself down and addressing my right brain all over again feels so daunting. Like releasing a box of butterflies into your home and marveling at how beautiful your living room looks until you remember that butterflies don't belong in living rooms and all the sudden you have to gather them all up for fear that they'll die or that you'll wake up in the middle of the night, your face covered in butterflies and somehow it's not nearly so charming anymore. This metaphor might need some work. The point is, allowing my creative mind to fly free also means I have new responsibilities, too. The caring and feeding of all the little ideas that flutter forth. Last time I did this with the hope that one of them would end up being, like, a champion Monarch when, really it ended up just being a Viceroy. A pale imitation. Well, at least according to the (OK rather limited) response I got from literary agents. It stung. Like, a lot. If I may introduce some more insect comparisons here, it felt like the time the wheel bug I was rescuing from a spider's web bit my index finger. I will now proceed with great caution (if at all) for any future wheel bug extractions. I do miss the magic though. The spark of an idea. The power of epiphany and those cathartic moments that are allowed to exist because they're finally given words and space. This creative void probably should never have been called a void. The stuff of creation is still swarming around in me, I suppose. The void was really the sadness of rejection. The feeling that I wasn't of this community that I'd hungered to be a part of. That it was all a dream. But what are dreams anyway? Sometimes, they're the place where ideas attempt to break through the monotony of every day. And there is so much of that right now – monotony Treadmilling. No space for dreaming. Though I have allowed plenty of space for excuses. Like the one that I'm getting older and should've already achieved a certain amount of success in order to make it as a writer. I just finished reading "Becoming Wise" (so much wisdom). And one piece of wisdom I gleaned from it is that in order to become wise, you can't talk yourself out of embarking on a new adventure. It's about accepting the journey will be both painful and joyful (potentially in equal amounts). But that the joy will help you forget the pain of it and that you will come out on the other side stronger, wiser and truer to yourself. Where is the little girl who swam until her toes were prunes? Better yet, how can I get mermaid mom to dive into some more waves?